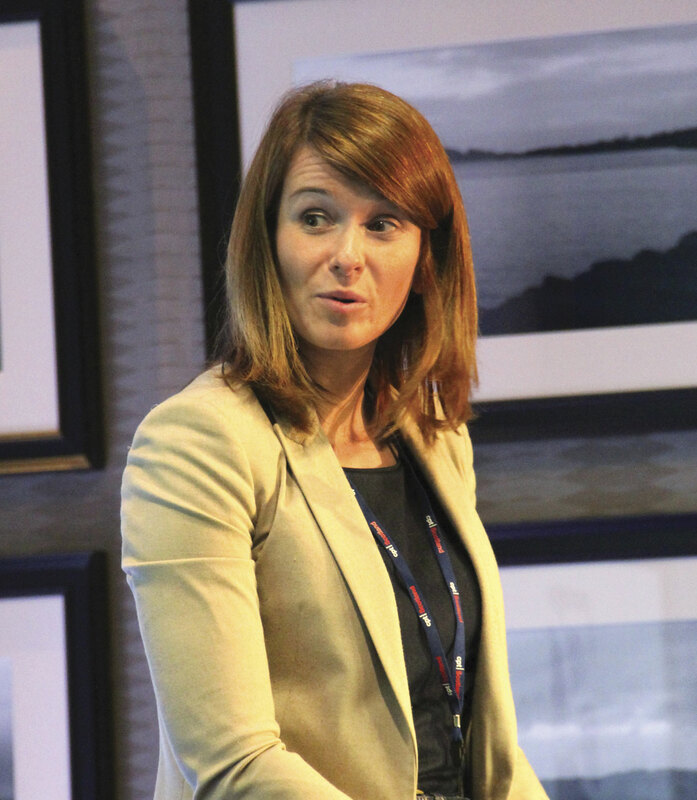 CPT Scotland’s Annual Conference was held last week at the Cameron House Hotel on the banks of Loch Lomond and it was the turn of Sarah Boyd, Head of Operations (Bus) at Lothian Buses, to take on the responsibilities of the Chair. With the CPT team, she had put together a varied and worthwhile programme with a broad focus, though not one but two Scottish Parliament ministers spoke. Sarah Boyd, Operations Director of Lothian Buses. Introducing the conference, Sarah noted how many times previously the future had been considered as a theme, going all the way back to the first conference in 1932 when Bailey PJ Dolan, Convenor of Glasgow Corporation Transport Committee, had addressed ‘The Future of Scottish Transport.’ She described 2014 as one of the most eventful years that Scotland had ever had, and said that the industry could not become complacent and we must not rest on our laurels. Discussions with the Government and others on smart ticketing had begun in March and the industry was a willing partner in this. ‘We are focused on delivering something that works for us all, but, most importantly, really achieves what the passenger wants,’ she said. Pointing out the enthusiastic reception to Lothian’s launch of M-ticketing, she said, ‘With the recent announcements about Apple Pay and Google Wallet we must collectively accept that we are moving past the point where a physical card is the holy grail to smart ticketing. It looks increasingly likely that the solution passengers want will not exist in this form. The lesson is that there is a real opportunity for us to save a considerable amount of investment and hardware and to channel this resource into considering new and innovative ways of paying. This is the time for us to think outside the box and show ambition beyond the insight available to us now’. Referring to a delay in the publishing of the draft Scottish budget, Sarah said, ‘we wait to see what the budget holds for BSOG and the National Concession scheme,’ pointing out that the most recent Transport Scotland research showed that 98% of users were satisfied with the scheme. ‘We would like to work together to overcome two associated issues: Passenger loadings and congestion. As operators we can commit to providing high quality services that encourage people to travel. Of the public sector, we would ask that infrastructure measures are designed and implemented to aid public transport. Together we can create a package of measures that brings more people on to public transport and collectively improves all of our green credentials.’ She argued that reimbursement for BSOG was related to this and urged that funding for this be retained and not penalised by limitation to low carbon vehicles. Keith Brown, Minister for Transport and Veterans. 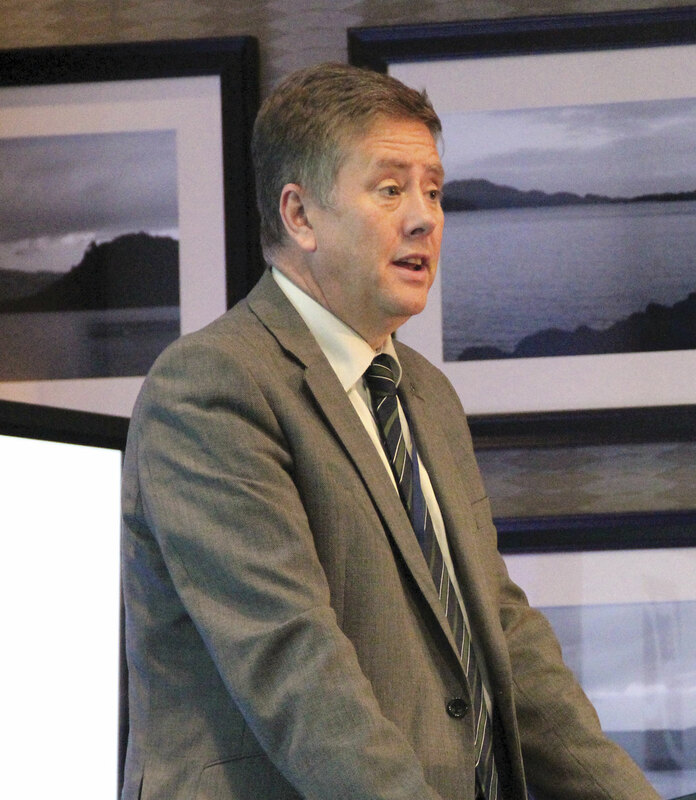 First of the Government speakers was Keith Brown, something of a conference veteran as this was the fourth year he had spoken as Minister, though it may be his last as he is standing for the deputy leadership of the SNP. He thought the referendum debate had seen ‘an extraordinary and unrivalled level of public engagement that bodes extremely well for the future.’ He felt it, ‘showed how passionate people could be about their society in Scotland and about building a better tomorrow if you get that engagement right.’ The SNP would contribute fully to Lord Smith’s work on the devolution of further powers and he looked forward to early and substantial progress on that, saying it would be unusual if transport was not a part of those discussions. Referring to the environment and congestion, he was keen to learn and apply the lessons wherever he could find them, both in terms of what to do and what to avoid doing. He believed the Government and operators shared a view of the importance of public transport, particularly bus, to the quality of life. ‘I think we can all agree on the central importance of three things,’ he said. 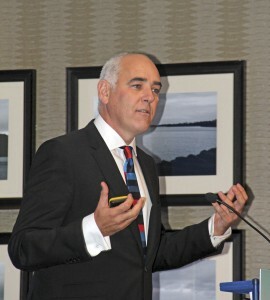 These were firstly, patronage, getting more people out of cars to provide the income needed to fund services, though he said the M77 hard shoulder running scheme was unlikely to go ahead, secondly, quality with factors such as convenience, affordability and reliability, and thirdly getting the funding and the regulatory framework right. He didn’t want to be too harsh on Iain Gray because he thought his motivation was a genuine desire to make things better for the customer, which only underlined the fact that you could have similar aims but very different views on how to put them into practice. ‘There are some areas of concern,’ he said, citing recent studies questioning the effectiveness of competition in delivering bus services and costs which were consistently rising above inflation. He acknowledged that costs rose for many reasons, some of which were beyond operator control but said, ‘an industry whose core product becomes ever more expensive in real terms is not one that is sustainable. Given the social and environmental role played by the bus that’s not a future that any of us, and you most of all, want to see.’ He noted that over the five years to 2013 patronage and mileage as well as the number of services and buses had been reducing while costs and fares had been increasing in real terms, which was not a recipe for success, though it had been a very difficult period. 2014 seemed to have gone better with promising trends in terms of patronage and mileage. He said a key proposal was for more time for local authorities to consider changes, proposed by operators, before they go to the Traffic Commissioner, increasing it from 14 days to 28 days. He thought this would enable transport authorities to consider moves such as subsidies or replacement without a break. The changes would require a mixture of secondary legislation and guidance. He also wanted to look at whether the additional service standards for which English legislation now provides could usefully be taken up in Scotland to increase the effectiveness and take up of the Quality Partnership option. ‘Unpunctual and unreliable services are pretty rare,’ he noted, though the Government was funding bus monitors from Bus Users Scotland, who were also handling the bus complaints process. Clear and straightforward methods of payments were important. Currently the complexity of fare tables, ticket types and the need for exact fares in cash presented a barrier to bus use, he said, stating, ‘I want to see all journeys on Scotland’s bus, rail, ferry, tram and Sunday networks able to be accessed via smartcards and smart payments. There are a number of positive developments on this front including mobile phone applications, operator specific smartcards, and we have to continue to see these spread across modes, becoming universal’. He acknowledged the need to see how existing machines on buses can be upgraded. 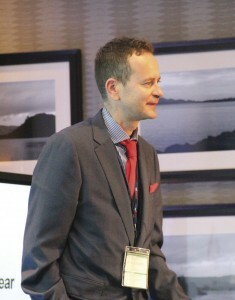 Returning to the conference theme, he said, ‘What do we want to see?’ answering this by saying that he had charged his team with identifying and taking forward, ‘Improvements to the framework within which operators and transport authorities work.’ He believed partnership was essential and fundamental. When bus companies failed or appeared to fail, it often stemmed from the absence of an effective regular exchange of information on issues, ideas and improvements with local authorities. A mutual endeavour to get this right would go a long way to securing a brighter tomorrow for the bus. Ian Craig, Chief Executive, Transport for Edinburgh. Twice a former Chair of CPT Scotland, Ian Craig had already hosted this year’s ALBUM conference. Giving the keynote speech he said that it was, ‘a time to consider the issues of the day as well as the challenges that tomorrow will bring’. 2014, with the launch of the tram, had been a defining year for the provision of public transport in Edinburgh, joining together the tram, bus and bus tour businesses. The vision was to be an integral part of the success of Edinburgh. The city’s appeal had to compete around the world and it needed to be first class, as did its transport offering. Transport for Edinburgh was an integrator, it was not a local transport authority and neither was it competing with any local transport authorities. Research had shown that the tram should have the same look and feel as the bus network and most definitely not the other way around. The new integrating logo had been well received and it would be used more widely in due course. He believed that. ‘The relationship we have with our customers and our communities runs deep and requires to be nurtured, cherished and never taken for granted.’ Understanding customers wasn’t easy and required huge efforts all year round. One way to undertake research was via a Twitter search. Social media was playing an increasingly important role in customer’s daily lives and we ignore it at our peril. ‘We must use it, not abuse it and never ever think we can control it,’ he said. Turning to the Passenger Focus customer surveys he had agreed last year, on a paid for basis, to participate in. He found it one of the best investments made, an opportunity to learn what and where improvements were required and inform debate with key stakeholders. The 96% rating Lothian had achieved was the highest anywhere, ever. Customer acceptance of the new mobile ticketing facility had, ‘exceeded expectations and then some.’ He had hoped that £1m of travel might be purchased using it in any year but that figure had been reached in the first five months, and these were full payment fares. On the environment he talked of a major focus on plug in hybrids saying, ‘The prospect of full electric zero emission operation through air quality zones is too tempting a prize for us not to go after.’ It was important to continue the momentum of the green bus fund. 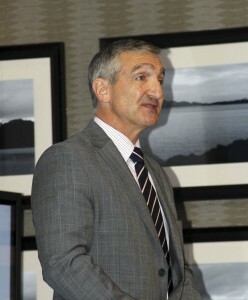 His presentation concluded with a showing of the new Lothian promotional video called, ‘one city, many journeys’. Billed as a panel session, Monday afternoon’s after tea session saw three separate papers delivered under the chairmanship of Alex Warner. Each of these was worthy of an article in it’s own right though space in this article will only permit brief highlights for now. Paul spoke about the Sheffield Bus Partnership in a packed presentation covering why it had come about, what it involved, how it had been implemented and the results so far. The four parties were SYPTE, Sheffield City Council, First South Yorkshire and Stagecoach Yorkshire. All four were united in a wish to grow the market and improve the customer offer, while each of the partners also had other aims, among those of the operators being a desire to avoid Quality Contracts. The origins of the Voluntary Partnership Agreement (VPA) were in 2006 when the situation in South Yorkshire was ‘pretty grim’ with First, the dominant operator, profitable but on the back of service and passenger decline and rising fares. The only competitor was Yorkshire Terrier which had stopped investing. Sheffield did have the first Statutory Quality Partnership in 2007 but though it was a success it was not a model for the rest of the city because of the cost of infrastructure investment. With the Stagecoach acquisition of Yorkshire Traction, competition was reinvigorated but the threat of an SQC remained and in 2010 SYPTE consulted on one under which it would have prescribed the fleet, fares and network and hoped for better reliability and punctuality. In light of this, Stagecoach made a partnership offer and First changed tack and did likewise, though initially the SYITA continued to pursue a dual track (partnership/SQC) approach. Introduced in two stages, it involved both operators’ key commercial services and associated tenders. On these services, inter available ticketing was introduced and rival weekly network tickets were accepted. Timetables were coordinated through Quality Agreements and there was some joint marketing. There was consultation on the proposals in June 2012, bids submitted to the Local Sustainable Transport Fund and the two to the Better Bus Area Fund were awarded in full, the DfT and OFT were consulted, under the BBAF agreement operators agreed to forego BSOG (on the basis that they were on the separate committee that decided how it was spent), and the scheme was implemented in October 2012. 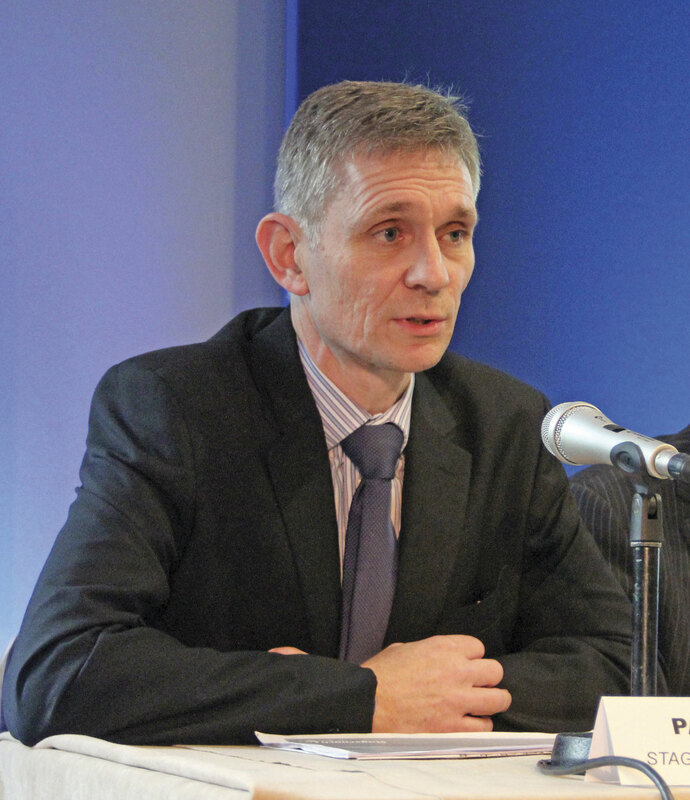 Among the commitments were that: it was for a minimum five year term; there was a single coordinated network with joint timetables on main corridors; there were protocols on operational matters; staff training commitments; extensive public consultation; network stability with major changes only allowed once a year; the use of future saved resource; investment in both vehicles and infrastructure; reduced prices and increased ticketing flexibility; fare increases limited to once a year for each fare; customer service plans and a customer charter; agreed service targets, data sharing and performance monitoring; and a joint marketing plan. Difficulties of the process were First taking the opportunity to retrench; the different fare levels between operators; investment given the differing fleet ages and recent investment levels; local authority and PTE investment commitments; and the very different organisational cultures. 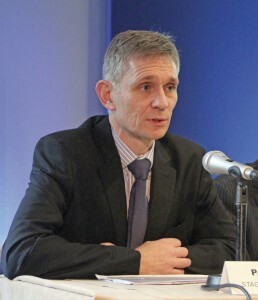 Phil Southall, Operations Director, Oxford Bus. In a similarly packed presentation, Phil ran through the situation in Oxford prior to the introduction of the Bus Qualifying Agreement and Oxford Smartzone in 2011. Oxford has had park and ride since 1973 and it now costs around £25 a day to park in the centre of a city that has had real time information for more than ten years. Having had the Balanced Transport Policy of the 1970s and 1980s and the Oxford Transport Strategy of the 1990s, the city decided in 2008 that there were too many buses using the city centre and indicated to operators that they needed to be reduced. In 2010/2011, the council set a further challenge to reduce the number of buses, approximately 60% of which were Oxford Bus and 40% Stagecoach Oxford. A barrier was the operators’ separate ticket systems and little progress had been made on this. The operators and authorities worked with the DfT and OFT to try and find a solution under the Transport Act 2008 using a series of Qualifying Agreements. Previous multi operator tickets had been expensive giving limited take up. To retain the customer experience on the four key corridors it was felt that the full range of ticket options had to be inter-available. Only having them on four corridors would have been confusing so it was agreed that the concept should apply across the Oxford urban area. Inter-available return tickets and weekly tickets were treated as MIT tickets by the OFT because the revenue was not transferred. Other period and multi journey products in the area were treated as MTCs. To administer the scheme and act as a clearing house for all transactions and settlements, Oxford Smartzone Ltd was set up, owned by the operators with no local authority involvement. This ticketing scheme satisfied the OFT block exemption stipulations. An information referee is employed a day a month to gather information from operators to determine the resettlements in each pot. Basically, the operator which carries the customer gets the revenue on a market share basis. The results of this include: 25% less buses in Oxford High Street, yet 55% of trips to the city centre made by bus; coordinated timetables on main routes; cross operator ticketing; and the introduction of low emission buses including 60 hybrids. He concluded that: the qualifying agreement was simple and straightforward; the ticketing is more complex but does not require local authority interference; and simplicity and high satisfaction levels have been achieved for customers – 98% in Customer focus research with 28% more journeys made. Further challenges for the future will be that all buses will have to meet Euro5 by 2016 and there will also be a new retail development in the city, as well as further development of smartcard applications to take in elements such as parking. The lessons learned included: don’t underestimate how long it takes to achieve a successful outcome; mutual trust and determination is key; keep talking when all seems bleak; undertake intensive questioning of the legal people; keep telling yourself that there is a way through this and keep the back office costs low. On this last point, Oyster’s back office takes up 15% of revenue, with the Oxford Smartzone that figure is 0.18%! 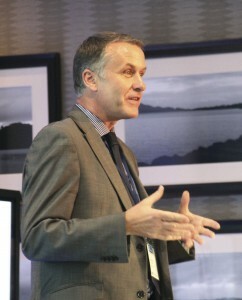 David Sidebottom, Passenger Team Director, Passenger Focus. Passenger Focus is an independent body funded by Westminster. In England, outside London, it represents the customer interests of bus, coach and tram passengers in addition to its national rail remit. 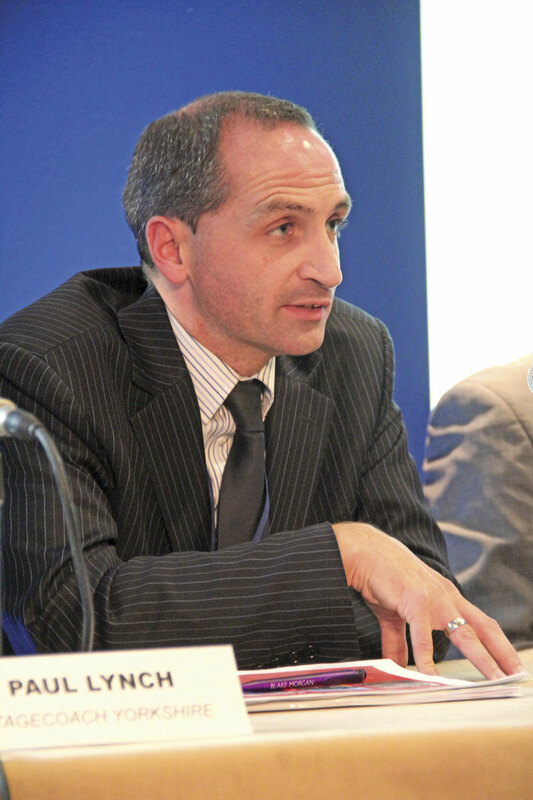 David Sidebottom explained that the organisation’s aim is to make a difference, not just be a think tank, through the generation of robust, evidence-based research and policy, representing passengers’ experiences and priorities. Its main tool was the Bus Passenger Survey which sought to understand the passenger experience across a diverse range of localised operations, using methodology and output developed in close cooperation with the industry. It sought to provide a benchmarked set of comparable results that could be used to drive change for passengers. In the 2013 survey it had carried out 34,000 interviews with passengers who had just used a bus service, across 34 area operations. 2014 would be the largest BPS to date with 45,000 passenger responses taken from across 46 areas. He also mentioned the partnership work Passenger Focus had done on punctuality, bus cleanliness, driver attitude and passenger perception of anti-social behaviour, in the West Midlands which had helped focus the minds of Centro and National Express West Midlands. Fergus Ewing, Minister for Energy, Enterprise & Tourism. Talking of, ‘social media and all that jazz,’ he said that 47% of visitors talked about their experiences on line. 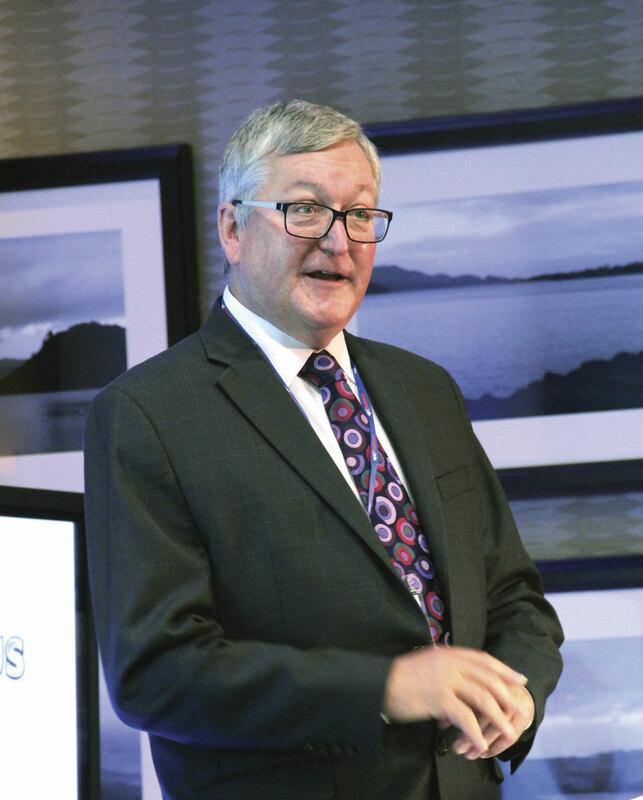 He continued, ‘if we want Scotland to be a top destination, we need to up our game as many of you already have.’ Ways this was being achieved included the attraction of business conferences with the help of a £2m fund designed to make this easier. After the ‘Year of Homecoming’ there was going to be a variety of annual focuses, with 2015 being a ‘Year of Food and Drink’, promoting Scotland’s outstanding larder, while 2016 would be the ‘Year of innovation, Architecture and Design’ and 2018 the ‘Year of Young People’. He wanted to see more done to encourage the disabled. In terms of physical access, the country was doing pretty well but there remained the question of attitude and in this regard training staff was key. He also advocated the use of access statements as a practical tool. 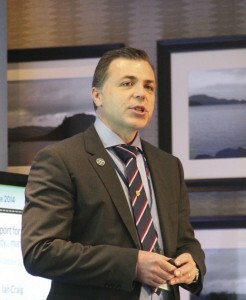 Chris Owens, CPT President & MD Alpine Travel. The CPT President responded to the Minister, who sadly couldn’t stay to hear what was said. Looking to the future he asked whether we could identify the opportunities? Andrew ran through the story of how TfL went to pay as you go systems including Oyster and has moved beyond that to the successful launch of contactless payment after seven years of development work. He told how Oyster, which is to be retained, has worked well though the complexities that have grown over time and it is technically coming to the end of its capability. There are nevertheless 60m Oyster cards out there and they are still being issued at a rate of 25,000 a day. Contactless payment is not for everyone, it is for people who need flexibility. You don’t need to get a card or pay a deposit you just turn up and go. Like oyster you do have to touch in and out. You don’t get overcharged (providing you avoid card clash) because there is daily and weekly charge capping. It answers the challenges of the high cost of revenue collection, barriers to customers and the difficulties of incorporating the intelligence within a card and reader by using a card that people already have, simplifies the money calculations by going to EMV contactless and moves to a back office controlled system. Introducing the system has required front office, back office and commercial changes to support its introduction, and it has also enabled TfL to stop taking cash. First piloted in October 2013, it has been operational on all buses since 2 August. Prior to his appearance at the Conference, CPT Scotland asked Alex to sample transport in Scotland and report back. 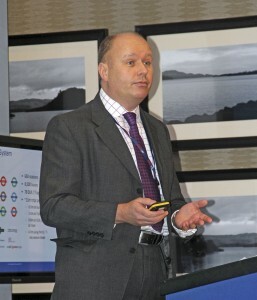 He did so in a lively and compelling fashion and though his positive findings on Scotrail obviously had no impact on First’s bid to retain the franchise, he had much of interest, some of it subjective, to say about what he found. I won’t name those he was critical off but a big pat on the back for McGills who thoroughly impressed him with their staff attitude and coherent image presentation. When I saw that Dr Redmond was described as a generational expert I feared a dull presentation on the minutiae of calculating concessionary fare reimbursement or some such, but I couldn’t have been more wrong. Fascinating and brilliantly delivered, the presentation explained what the different generations are, what characterises and motivates them and what you need to do to attract them. Apparently, Generation Y men are always late turning up, but Generation Y is also the key to your business future. There was much, much more, I suggest you check out Dr Paul Redmond online to find out more and inform your marketing team of this. Vice Chairman, Andrew Jarvis, who will be Chairman for next year’s event, closed the conference by summarising its content and telling delegates that the dates and location for the 2015 Conference would be finalised soon.